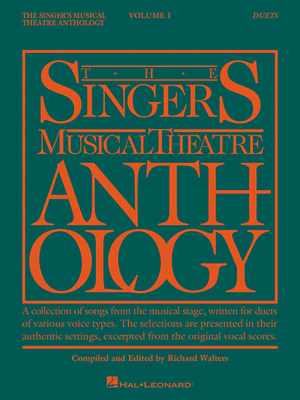 The Singer's Musical Theatre Anthology: Vocal Duets Book Only (Singer's Musical Theatre Anthology (Songbooks)) (Paperback) | The Drama Book Shop, Inc.
(Vocal Collection). All duets here are Male/Female combinations. Contents: Bess, You Is My Woman (Porgy and Bess) * I Have Dreamed (The King and I) * I Loves You Porgy (Porgy and Bess) * It Never Was You (Knickerbocker Holiday) * Make Believe (Show Boat) * A Man and a Woman (110 in the Shade) * My Heart Is So Full of You (The Most Happy Fella) * People Will Say We're in Love (Oklahoma ) * Salzburg (Bells Are Ringing) * Strange Music (Kismet) * The Touch of Your Hand (The Cat and the Fiddle) * Too Many Mornings (Follies) * We Kiss in a Shadow (The King and I) * We'll Go Away Together (Street Scene) * What You Want Wid Bess (Porgy and Bess) * When the Children Are Asleep (Carousel) * Will You Remember Me (Knickerbocker Holiday) * With So Little to Be Sure Of (Anyone Can Whistle) * Wunderbar (Kiss Me, Kate) * You Are Love (Show Boat) * You're Nearer (Babes in Arms).